If this is winter, how come I’m still riding? It’s the middle of winter in the Bay Area and my internal motorcycling clock should be directing me toward a number of off-season repair projects. My bike’s in desperate need of a valve adjustment and oil change. And there are two small scratches I picked up last summer that need to be sanded down and re-painted. But the valves are still clacking. The oil is unchanged. And the can of touch-up paint I bought at great expense is still staring at me from across my garage, unopened. I can’t bring myself to do the usual chores in preparation for spring because winter never really came this year. I never stopped riding. Unlike years past when I camped out with my bike in the garage, staring out the window at a cold rain, this winter has been dry and sunny. I’m taking advantage of the great weather, feeling almost guilty as I don a spring riding jacket and hit the road. I’m not alone. As I hurtle down the freeway I see the rest of you out there too. I feel like we’re getting away with something that people in cars don’t understand. It’s February … and we’re riding! I’m grinning under my full-coverage helmet. 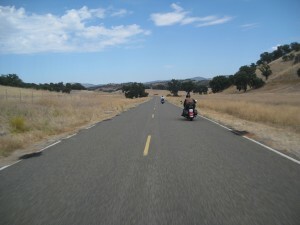 But as I pull onto a favorite country road and head into some twisties, I feel the bike hesitate, ever-so-slightly. I should change the air cleaner and replace the plugs, I think. I sense throttle play when I exit a turn a little wide. Maybe the cables are worn. I should fix that. Then my mind drifts to the ugly scratches on the front fairing. I hope no one sees me in this condition, I think. What am I doing out here? I slow down, flip a u-turn, head back to the barn. I’ve got work to do.